A RUP LIFE: Liberty's Kids - The Complete Series only $9.99!!! 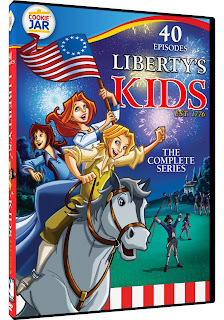 Liberty's Kids - The Complete Series only $9.99!!! I am super excited about this price for this collection! I've been searching for it on netflix but it hasn't been on there for sometime so for only $9.99 (free shipping with Amazon Prime!!!!) That is an awesome deal!!! It is a pre-order so it will ship July 16th. Order your copy of Liberty Kids - The Complete Series here! Are you a amazon prime member? I have to tell you that has been a huge blessing to our homeschool. Almost everything we've ordered ships in 2 days! So if there was a book we needed and our library didn't have I was able to order fast. I've also found that the prices are better than the local stores for many products (like pistachios for instance). I don't have that extra time to shop ten different stores during the school year with homeschooling so it has been a huge help to be able to pull up a product I like and order. One free book for your kindle a month to rent.